july 24, 2000. Like a static-filled radio transmission that suddenly becomes crystal clear, the vague rumblings of discontent that increasingly disrupt this city’s smooth operation have acquired a voice. Its message is simple: it’s time to take another look at the direction of San Francisco’s growth. Hundreds of volunteers are fanning out to all parts of San Francisco with a petition that needs 20,000 signatures by July 31 to claim a place on the December ballot. They’re everywhere: you’ve probably seen them outside your supermarket or café. They’ve vowed to continue a task begun in 1986, when residents also challenged rampant development — and won. Entire neighborhoods where large-scale offices were never contemplated, never planned for, are being transformed by office projects that overwhelm them because the Planning Department has "defined" away the problem. The Mission, Potrero Hill and South of Market, which have already borne the brunt of massive amounts of "live/work" projects, are being rapidly transformed. Arts and community-serving non-profit organizations, neighborhood businesses, and critically needed businesses which produce, repair and distribute goods are being forced out of San Francisco because they cannot afford to compete with office uses. • Defines offices to include "dot.com" office uses. • Defines live/work as housing. 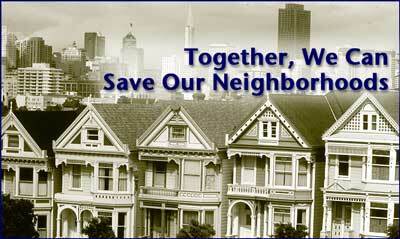 • Restates and strengthens critical neighborhood protection policies. • Protects non-profit agencies and arts uses from having to compete with office uses. • Establishes a competitive process for selecting which office developments should be approved. • Establishes criteria for how that decision should be made. • Provides for new office development to include space for non-profits. • Protects existing businesses from displacement by office uses. • Adjusts the annual limit to exempt office space developed by government agencies for government use. • Exempts office use at the Presidio, Pier 70 and Bayview–Hunters Point Shipyard from the annual limit calculation. • Requires the city to develop a comprehensive plan to protect four areas in Hunters Point, the northeast Mission, the base of Potrero Hill and western south of Market. No office use may be approved in those areas until a plan is complete. • Finally, with the possible exception of one site, no additional office space is allowed in the Mission. .For further information or to obtain a copy of the petition, call the Campaign to Preserve Proposition M at 415 951-2426 or go to www.savesanfrancisco.org.